THE GLOVES are off in Pegeia following an ‘all Peyia meeting’ held in the municipality on Sunday organised by officials angered by the public’s opposition to development of the sea caves coastline. A proposed ‘white zone’ suggested by Green party MP George Perdikis incensed local authorities and Paphos MPs of four of the main political parties, who subsequently issued a joint statement declaring Perdikis ‘persona non grata’ and ‘undesirable’ in Peyia. Andreas Evlavis of the Paphos Greens told the Cyprus Mail on Monday that such behaviour was incendiary. “If you start off like this, saying that Mr Perdikis and the Greens aren’t welcome in Pegeia, you are trying to start a war. But whether we are welcome or not will not stop us from carrying out our duty and right to fight for the environment, this is our priority,” he said. He added that the benefit of a protected environment is not for the Greens but for the public. The meeting came after weeks of demonstrations and press reports about six villas being built close to the sea caves area and that an environmental impact authorisation has just been granted for a five-star hotel and 44 villas at nearby Kafizis beach. The wider public has been angered over environmental damage at the sea caves, but supporters of ongoing development claim that reports in the press concerning the work at the coast are misleading. Mayor of Peyia, Marinos Lambrou, called the meeting and was the main speaker at the event. He reportedly said that local authorities have recently been facing an unfavourable policy against Peyia and that for some time the municipality has proposed specific measures for the protection of the sea caves area. Also present at the meeting were three of the four districts MPs , Costas Constantinou of Disy, Charalambos Pitokopitis of Diko, Andreas Fakontis of AKEL and a spokesperson for Edek MP Elias Myriannthis, who is currently abroad. The mayor of Polis Chrysochous Giotis Papachristofi also attended. MPs and the mayor spoke of ‘dark economic circles’ intervening in all cases of attempted development in the district of Paphos, citing examples such as the Akamas and Polis Chrysochous, claiming that the new effort is to keep tourist development away from the coastline of Peyia. Last Friday, Agriculture Minister Costas Kadis said he would announce 20 measures to help resolve the ongoing debate, his proposal includes banning water sports and fishing within 300 metres of the caves used as a breeding ground for the endangered monk seals and the creation of a buffer zone that will not allow development within a certain distance of the beach’s protection zone. Lambrou said that the municipality is in favour of development, according to the laws of Cyprus, and described proper development as a ‘blessing’. He also said that without growth, the municipality and residents would not be able to move forwards. The mayor added that there had been no opposition to similar developments in other areas such as Limassol, Larnaca and Ayia Napa. Lambrou later told Astra Radio that a war had been declared war against the municipality of Peyia and lies and misinformation being spread in the media. Evlavis said that the Greens are waiting for the results of the investigations concerning the changes of zoning regulations. 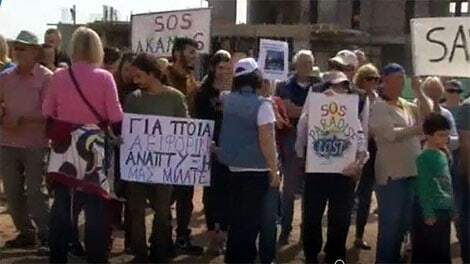 Pegeia councillor, Edek’s Achilleas Achilleos, who chose not to attend Sunday’s meeting, said that great care must be taken over the environment, especially in the sea caves area, as once it’s destroyed, it will be impossible to get back. “Any development must be undertaken sensitively and with care. We need to take a step back and it’s not all about money and profit and then we have problems afterwards,” he said. Achilleos said that the blame for the current situation lies firmly on the government’s shoulders and stressed that outdated maps of the coastline need to be updated and that the government, along with the land registry and planning departments are all responsible for dishing out permits without checking the area. He said that much of the coastline has been eaten away due to erosion and an updated and protected zone of around 100m or 200m from the shoreline which ‘could not be touched’ is very important. “Leptos has built six villas, why not three. The coat will continue to be eroded and then the municipality will have to pay for the construction of expensive breakwaters. In the end it’s the public that will pay for the damage to the environment,” he said. He added that development of the area is a thin line which must be walked carefully. Local resident, Peyia coalition councillor and Green party member, Linda Leblanc said that she was disappointed that the mayor didn’t take a more neutral stance and said the Greens and other environmentalists would proceed in a calm manner whilst gathering support to ensure that the area is protected. She added that around half of the residents of Peyia are foreigners, mostly British, are totally ‘invisible’ in this discussion as requests to also disseminate information in English fell on deaf ears. “They are trying to divert us from the issue which is uncovering any illegalities concerning zoning and studies that were not done properly” she said. Leblanc reiterated the need to have a masterplan for the area. The – apparently – unstoppable destruction of a once-beautiful island. The thought of losing your new supply of brown envelopes can be very frightening.